To make the most of the speed of your Internet connection it is advisable to have the operating system in perfect conditions and also to have a good browser like Firefox. If this is the application that you use to view your favorite sites, to read blogs or to download files, you will probably find FireTune handy. A utility that will adjust the Mozilla browser. 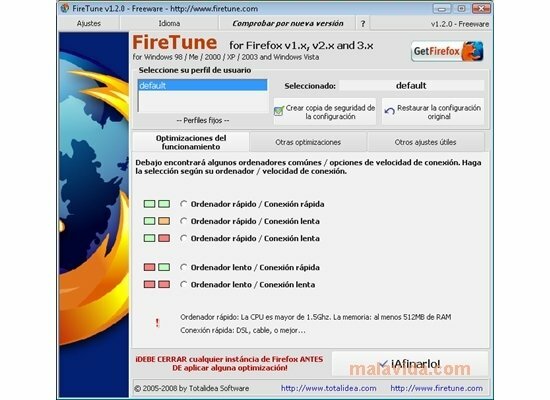 FireTune adjusts Firefox's configuration based on your computer's features and the speed of the Internet connection to optimize how it works. For a safer use, it allows you to generate a backup of the original settings. This utility is very easy to handle, because it carries out all the browser optimization process automatically, without requiring the user to set complex configurations. Even though, if you wish to do so it will offer you the possibility to choose some extra options like activating objects' cache over a secure connection, show an error page in substitution of the typical box with the error message, optimize how Firefox uses the memory or activating the autocomplete URL function. If you want to optimize Firefox in a matter of seconds, download FireTune.